In the last few weeks, numerous articles and analyses have been produced relating to the murder of Jamal Khashoggi in the Saudi consulate in Istanbul. However, the relationship between Saudi Arabia and the United States has not been questioned, and the reason for this has not yet been explained. Nixon’s decision in 1971 to withdraw the United States from the gold standard greatly influenced the future direction of humanity. The US dollar rose in importance from the mid-1950s to become the world reserve currency as a result of the need for countries to use the dollar in trade. One of the most consumed commodities in the world is oil, and as is well known, the price is set by OPEC in US dollars, with this organization being strongly influenced by Saudi Arabia. It is therefore towards Riyadh that we must look in order to understand the workings of the petrodollar. After the dollar was withdrawn from the gold standard, Washington made an arrangement with Riyadh to price oil solely in dollars. In return, the Saudis received protection and were granted a free hand in the region. This decision forced the rest of the world to hold a high amount of US dollars in their currency reserves, requiring the purchase of US treasuries. The relationship between the US dollar and oil breathed new life to this currency, placing it at the centre of the global financial and economic system. This privileged role enjoyed by the dollar allowed the United States to finance its economy through the simple process of printing its fiat currency, relying on its credibility and supported by the petrodollar that required other countries to store reserves of US treasuries in their basket of currencies. This arrangement continued to sustain itself in spite of numerous wars (the Balkans, Iraq, Afghanistan), financial crises (the Black Monday of 1987, the Dotcom bubble of 2000, and Lehman Brothers’ subprime crisis of 2008), and the bankruptcies of sovereign states (Argentina in 1998). The explanation is to be found in the credibility of the US dollar and the US itself, with its ability to repay buyers of treasury bonds. In other words, as long as the US continues to maintain its dominance of the global financial and economic system, thanks to the dollar, its supremacy as a world superpower is hardly questioned. To maintain this influence on the currency markets and the special-drawing rights (SDR) basket, the pricing of oil in US dollars is crucial. This explains, at least partially, the impossibility of scaling down the relationship between Washington and Riyadh. Nobody should delude themselves into believing that this is the only reason why Saudi-US relations are important. Washington is swimming in the money showered by Saudi lobbies, and it is doubtful that those on the receiving end of such largesse will want to make the party stop. The agreement made between Washington and Riyadh guaranteed that the latter would receive protection from the former and Washington would look the other way regarding Riyadh’s behavior within its kingdom and in the region – so long as Saudi Arabia sold its black gold in US dollars alone. This agreement was clearly a controversial one and has been kept away from the general public, even in the light of Khashoggi’s death and the liberal mainstream media’s piling on the Kingdom. Yet this is not the only reason why US-Saudi ties are so close. The initial agreements between the Saudis and the Americans concerned the petrodollar; but after the Islamic revolution in Iran in 1979 (Iran’s nationalist prime minister, Mohammad Mosaddegh, had been previously overthrown by the US and UK in 1953), Riyadh and Washington decided to declare war on their common enemy, with the hearty approval of Israel. The cooperation between Riyadh and Washington became even closer in the 1980s, through the common campaign against the USSR in Afghanistan through the use of jihadists recruited, trained and armed by the Pakistan, Saudi Arabia, and the US secret services. The use of jihadist terrorism as a geopolitical weapon has been a main feature of Riyadh’s statecraft. The relationship between Saudi Arabia and the US evolved from a mere economic and protection agreement, to a full-fledged collaboration against the shared enemies of Washington, Tel Aviv and Riyadh, expanding on the existing cooperation since the 1980s of using jihadism to advance strategic objectives. The situation with Iran became of primary importance for US strategy in the region. Riyadh, with the passage of time, assumed a triple role, namely, that of being the guarantor of the petrodollar, a facilitator in the use of Islamic terrorism as a geopolitical weapon, and a regional opponent of Iran. This relationship has been mutually beneficial. The House of Saud has been free to run its country according to the strict strictures of Wahhabism without Western interference; and Washington enjoys a capacity for unlimited military spending (especially after the 2008 crisis and the beginning of quantitative easing) simply through the printing of debt in the form of government bonds that are immediately acquired by other countries. Washington has effectively been printing waste paper and obtaining consumer goods in return, a state of affairs that has allowed the United States to squander six trillion dollars in wars in Iraq and Afghanistan without suffering significant economic consequences. Ever since Donald Trump took over the White House, the process of de-dollarization that begun during the Obama era has only accelerated. With the unprecedented move in 2012 to remove Iran from the SWIFT international banking system, a dangerous precedent had been set that acted as a warning to the rest of the world. The United States revealed itself as willing to abuse its dominant position by wielding the dollar as a weapon against geopolitical adversaries. The consequences of that action continue to be felt today. Many within the Western elite have come to recognize this mistake and are regretting it. Russia and China understood that they were next on the chopping block and set about creating alternative payment systems like CIPS that would serve to act as a backup system in case Washington tried to exclude Moscow and Beijing from the SWIFT system. Trump contributed more than any of his predecessors towards further pushing the world in the direction of de-dollarization. Sanctions and tariffs have weakened confidence amongst US allies and forced the rest of the world to start looking for alternatives. The cases of Iran and Russia are instructive, with commercial exchanges being undertaken in currencies other than the dollar for a number of years now. There are dozens of other examples where the use of the dollar in commercial transactions has been abandoned. More complicated, however, is the financing of debt for private or public companies that often takes place in dollars. This exposes industries to a difficult situation in the event that their national currencies devalue against the dollar, making it more expensive to find the US dollars needed to repay creditors, leaving what are major national companies with the prospect of facing bankruptcy. As Russia learned in 2014 with the attack on its Ruble, exposure of potentially strategic sectors of the country to the economic influence of a foreign adversary should be avoided. The push to renounce the use of the dollar in financial transactions also stems from the fear that the next financial crisis may affect global debt as expressed in dollars; not only destroying the US economy, but dragging down with it countries that are large holders of US treasuries. This is not speculation or conspiracy theory but simple deduction from observing the economic situation over the last 10 years. The global economy was saved in 2008 as a result of the confidence held by citizens following the intervention of central banks. The corrosive mechanism laid out by the Fed and its partners became evident months later. Central banks started printing unlimited amounts of money at 0% interest rates and furnishing it to banks and financial institutions to cover the debts left by the bursting of speculative bubbles like the one involving subprime mortgages. The average citizen, seeing Bernanke and Draghi on TV talking about "unprecedented actions to save the system", felt reassured, and therefore felt their money remained safe, in banks or in US dollars. The next financial crisis – potentially the worst ever – is likely to be caused by either the raising of interest rates by the Fed and other central banks, or from the popping of one of the numerous debt bubbles around. The central point is that the citizens’ belief in the system will be put to the test because, as Draghi said, "[this weapon of QE] can be used only once". There is no protection for banks and speculative entities that could be in debt to the tune of many billions of dollars with no chance of survival. With a view of to the possible collapse of the dollar-based financial system, several countries are selling their US government bonds, reducing their exposure and accumulating gold. This involves not just China and Russia, but even the European Union. In such a situation, a crisis in relations with Saudi Arabia is unthinkable for Washington, especially when the region now seems to be guided by an axis that starts from Tehran and ends in Beirut, including Baghdad and Damascus. Riyadh is necessary for the Israeli strategy in the region, and Washington follows in tow for reasons related to the US dollar. Factoring the importance of Riyadh in supporting the petrodollar and in countering Iran in the region, it is not surprising why the Israeli lobby in Washington is doing its utmost to calm US senators down intent on punishing Riyadh for the Khashoggi affair. If Saudi Arabia were really convinced of the innocence of MBS in the Khashoggi affair, it could use this situation to its advantage by reducing the role of Washington in its foreign policy. Turning to the east and increasing partnerships with China and Russia would have beneficial effects on the whole region, as well as reducing the importance of the United States in the world. Saudi Arabia is governed by a large family riven with divisions and feuds spanning decades. MBS has no interest in his kingdom and is occupied with his survival alone. He is aware that Netanyahu and Trump are his best bet for continuing to reign. Trump is equally aware of the importance of MBS in his communication strategy in the US, with a view to the midterm and the 2020 elections. MBS is for Trump the golden goose that finances the MAGA project, thanks apparently to Trump’s mesmerizing negotiation skills with the Saudis. Of course this is far from the truth, but what matters is the spin that Trump gives to this alliance. Israel is the primary ally of MBS, given that the crown prince is the first Saudi monarch openly willing to establish diplomatic relations with the Jewish State and bring relations between the two countries out into the open. 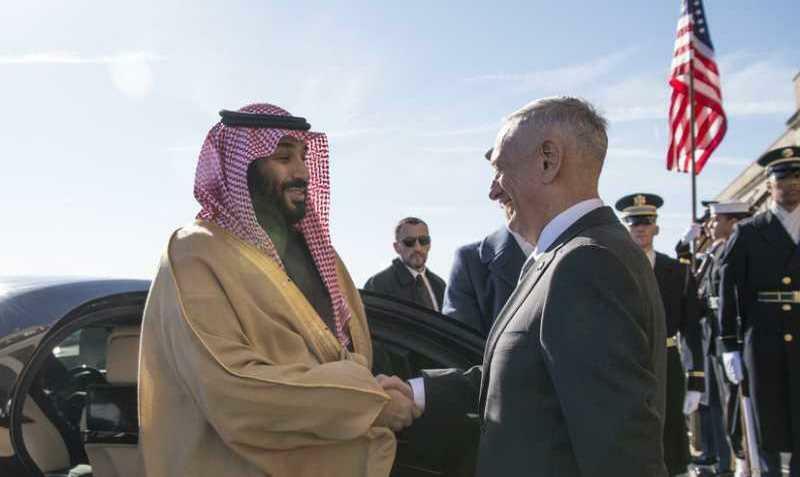 The upper level of the US government, the so-called deep state, tried for a few weeks to use MBS against Trump. But this strategy came to an end after the Israelis, together with some elements of the US deep state, saw the risk of downsizing the global relationship between Saudi Arabia and the US. MBS will hardly be pushed aside, and within the Kingdom his position seems firmer than many expected, as seen at the Davos in the Desert conference. Breaking up with MBS would have had unimaginable repercussions for the US’s hegemonic position, and this is something Washington can ill afford at the moment. The use of jihadism and petrodollars as political and financial weapon against Washington's adversaries is reason enough to quickly forget Jamal Khashoggi and go back to ignoring the various abuses committed by Saudi Arabia. In this phase of the transition from a unipolar to a multipolar world, the US cannot afford to renounce some of the most potent weapons in its arsenal to wield against its geopolitical foes.